Why would you blanket blacklist a block if you intend to use it in a gamestage? I think you're misinterpreting what the "gamestage" listing does. It doesn't UNDO a blacklist. It's its own conditional blacklist that is applied after the global one has been enforced. It's done this way so, for example, if you staged the "logWood" ore dictionary, you can still blacklist one or more subtypes outright from being included. Inverting this behaviour would not only be less intuitive but also much more tedious to setup in such an example (think of all the modded trees you'd have to individually stage). Oh, so if I remove sand from the blacklist cfg, and use that json with the overworld stage, it would block sand vein mining it in that stage? Correct. 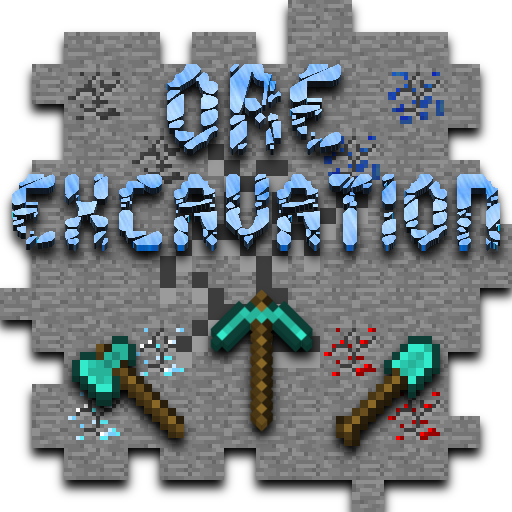 Until the player has the "skyblock" stage unlocked, they should be unable to perform excavations on sand. Is there a way to flip the blockGroups json entry to a blacklist to use oreDict? I noticed that the description said you can blacklist via ore dict but I'm having trouble finding the documentation to blacklist. Can I add a new shape to the config? If so, how? Particularly, I want a shape of 1x5 or wider so I can remove 1 layer of something at a time. While in-game if you hold the Ctrl key then press the keybind for switching Shapes it should bring up the editor. Currently the 5x5 is the largest allowable shape dimensions. I am trying to add cobblestone/stone and all ores together so that I can shape mine without having to constantly grab the blocks that differ from the initial block seperately. The config doesn't currently support partial wildcard matching such as "ore*" sorry. To be fair, even if this did work, you'd probably run into issues when it comes to ores in other non-stone materials. Most tools should be natively supported by the mod without any such addons. Double check your config settings aren't placing unintended restrictions on tool usage. Is there an option for excavation to take proportionally longer the more blocks it's going to break, similar to the way TreeChopper handles its function? OE doesn't pre-scan blocks for a number of reasons and therefore can't do that proportionately. It would also cause spikes in tick time for considerably large excavations (like digging out huge tunnels). I could maybe make a fixed speed multiplier to slow down down the harvest by a set amount when the player attempts an excavation. If TreeChopper is pre-scanning then I'd be interested in what happens to a server if you were to say, take a few players to harvest jungle trees or the huge trees in the twilight forest. Better yet, just make them spam left click the trees to re-scan constantly without ever breaking them. Even if you were to disable those material types, there's nothing saying a malicious user can't make an enormous artificial tree from another valid material. I believe that there was a fix for this in Sponge or something? I however haven't been able to find it yet. I was hoping you could help me with it? 2) I don't do bug fixing for Sponge or Optifine related issues. Is it possible to ignore the Black/White list while shape mining is set to anything other than none? If not could you please make that an option?